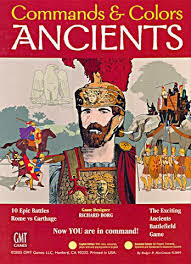 I have dabbled in ancient war games since the early 1980s. I first cut my teeth using WRG 6th edition and had many interesting games using these rules. My first two armies were Carthaginian - one in 25mm and soon after one in 15mm. The 25mm version came from my old friend Chris Hardman and was a mixture of Minifigs, Garrison and probably a few Lamming figures thrown in for good measure. When I acquired it from him all I needed to do was to round up a couple of units and tackle some rebasing and in short order it was in action. I quickly learned that the army fought best of all when the points values were low so fighting at 1,100 points (including the general) quickly became my preferred Modus Operandi. With the 25mm army (back when 28mm was in fact 25mm) the closest I ever came to fighting anything like contemporary opposition was against Chris Hardman's Seleucids - the 'Swiss army knife' army. As I recall I fought him twice - once at Rochford when we went for 3,000 points and I was comprehensively beaten and the second time at the club when I was able to grind out a draw. Actually we called it a draw as we had run out of time and I was grateful to be offered the same! The 15mm version did manage to fight a Republican Roman army (in fact it only fought against Republican Romans) but every game I took part in ended in a draw. I further dabbled with a Late Imperial Roman Army - that was great fun to use - and also a Classical Indian. I can still recall the Irregular B elephants with a general going impetuous and charging downhill into a Roman Legion - then throwing a maximum plus in the resultant melee! I kind of fell out of love with the period (rather I was distracted by other things) until DBA came along and most of my figure games since then have been using these rules. I owned a 15mm Numidian Army that was fun to use - a throwback to my Carthaginian days I suppose - but have never really pushed on with the period like I did in my early days. However, all of that can now change. Romans (in red, naturally) and Barbarians prepare to get to get to grips - or should that be Agrippina? The picture is courtesy of Google Images. Some time ago I acquired a copy of the Richard Borg designed Command and Colours: Ancients. This has been a successful series and covers warfare in the ancient world from the time of the Hoplites until the fall of Rome. 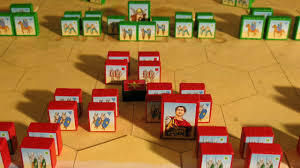 the basic game covers the Punic Wars and the expansions cover the wars of Alexander and his Successors, the rise of Rome and the end of the Hellenistic era, the wars against the various Barbarians, the wars against the Persians from the Hoplites until Imperial Rome and the final stands of the Legions. In common with the other Command and Colours games the action is card driven and the units follow the usual 4, 3 and 2 block size standard. Aside from the official scenarios contained in the rule books the game is really well supported with a whole world of internet based goodies - rules variants, army lists, scenarios and much else besides. I have in addition to the base game a whole pile of blocks from the expansion sets so the collection is pretty complete. With the material I have to hand I should be able to fight pretty much any kind of ancient battle and whilst this will not be my main area of endeavour it certainly gives me something a little different to dabble in. I am not expecting to go down the figure route with this as the blocks are perfectly adequate. Hopefully I may have better luck with the Carthaginians than I ever did using figures all those years ago! Despite suffering from a bout of Bronchitis I have had last managed to make a start on cutting out the replacement counters for my planned Jutland refight. Thus far I have completed both the Royal Navy and the High Seas Fleet and the optional 'scaled' Light Ship counters. The latter are very important as I have mentioned previously because the counters in the original game represent formations that are too large. Having a single counter representing some 16 destroyers whilst the capital ships are individual does make for some strange tactical decisions. Under the new system the same formation would be represented by four counters - this is much better from a gaming perspective as the player would be able to make decisions about formations, station keeping etc. It will change how the rules work and this will be something I will need to test. In the interest of easing myself back into using the core Jutland rule system - it was some 30 years ago I last used after all - I am planning to run a small test game over the next few days with the results posted to the blog. There will be one change though and that concerns the move distance and ranges. The game as designed uses a measuring device - called the rangefinder - scaled at 20mm equalling 1,000 yards for gunfire. This means that 48cm represents 24,000 yards. For me that is a little too short so I am using 1" to a 1,000 yards. Ships move according to a special gauge with a movement factor of one point for every 2 1/2 knots. Each movement point on the gauge equals 15mm so between the movement and firing ranges there is a difference in how they work. I would prefer a uniform scale of measure so that will be my first priority. The scenario I envisage running will pit two small forces of battle cruisers in that old standby the encounter battle. At least fighting a game will not be interrupted by my irritating coughing - which makes painting a challenge for sure! Following on from last post - a very brief overview of Cavalier at Tunbridge - I thought it would be a good idea to detail my half of the exchange I undertook with Bob Cordery of Wargaming Miscellany fame. My part of the transaction was a pile of blue Hexon terrain tiles (the remaining green and desert sets are now heading north of the border) and in exchange I received rather a nice and useful selection of books. Bob is a cunning chap and I suspect that he knew EXACTLY which of his titles that he had deemed surplus to requirements would be of interest to me - and he was not wrong! The North West Frontier in two quite different wars - one that Wellington would have been comfortable with and the other with lorries and aircraft. They have certainly made me think about revisiting the Roghan Valley! A smattering of naval titles - all at the lower tactical end of the spectrum and therefore hugely gameable! The two that have proven to be of most interest are the small paperback on inland river transport in Mesopotamia and that wonderful book on the Konigsberg. The rest of the rest. The three pamphlets you see are from Pallas Armata and cover the campaign in Thrace during the Balkan War whilst the three Hoyt titles speak for themselves. The Zanzibar title is also very interesting and is full of ideas for small scale actions - gunboats, landing parties and similar. NOT from Bob but worth mentioning all the same. The final title in this post caught my eye simple because the Lawrence connection. Sea power dominated the Red Sea and the elderly ships of the RN that were on station gave sterling service in support of the Arab Revolt. Whilst the Turks had no naval presence to speak of the potential for some cracking 'what if?' actions is huge. On Sunday I was fortunate enough to be able to visit the Cavalier show in Tonbridge - and in the words of Wallace and Gromit it was 'A Grand Day Out'! The haul. There are few things in life more pleasurable than acquiring a new book (or 4). To begin with I spent some time with Dave Lanchester helping to set up his stand. This is always good fun and is a good opportunity to see what's new in the remaindered and secondhand book world. I must confess that it is seldom I visit Dave's stand without buying something and the three books you see in the picture (not the Turkish title) are now residing happily in the library in the man cave. Needless to say there are a number of ideas that these new acquisitions will be supporting in due course. Caliver Books were also in attendance and after a brief catch up with Dave Ryan money duly changed hands and the Ottoman uniform title was also added to the collection. For the record I reckon that I have enough uniform material on the Turkish army from 1912 to 1923 in my collection so producing an army should not be a problem (other than painting it of course....). Tumbling Dice were also present and the painted examples of their 1/2400th scale Russo Japanese War ships (and the new American range for the Spanish War of 1898 or the Great White Fleet) are really very nice indeed. I managed to avoid buying any of these - for the moment anyhow - but I did pick up a 1/600th WW1 starter pack with German artillery. These 3mm figures are very nice indeed and although purchased as an experiment have a lot of potential for a number of ideas I am currently planning. Aside from the retail therapy (which is pleasant enough in its own right) Cavalier was also a chance to catch up with old friends and acquaintances, to chat about projects old and new and to see what kind of games were being played and displayed. One of the main orders of business for myself was meeting up with Bob Cordery of Wargaming Miscellany fame. We had a transaction to conclude involving two boxes of blue Hexon tiles and a box of extremely useful books - which will feature in a later post. Bob and I also discussed an idea I have been toying around with and as ever his input was very useful - especially some of the names he came up with - again, more of which in a later post! I was hoping to get some of my pictures of the games on display but for some reason the resolution was not great so I will leave that to the other bloggers that were present. All in all it was a grand day (or in my case half a day) out with just the right balance of camaraderie, retail therapy and inspiration.